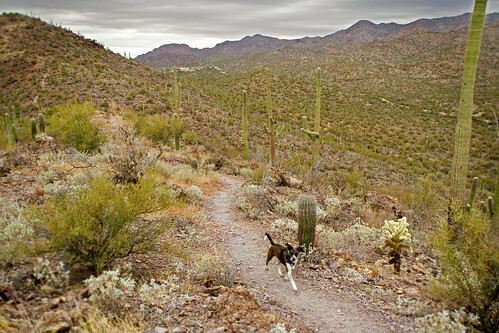 Knowing where you can and cannot take your pooch with you on the trail around Tucson can be tough. Yes, Trailvoyant has a dog friendly hike filter that makes finding a great hike you both can enjoy easy, but it can also be helpful to understand the general landscape so that you'll know in which areas of the map to look. And you'll definitely need to know this stuff if you want to build your own adventure for a custom day hike or backpacking trip. The rules regarding whether dogs are allowed on the trail or not are determined by the various agencies that manage the land that the trails pass through. With so many different authorities managing land around Tucson, knowing the rules can be confusing, so we'd like to clear that up. Generally speaking, state parks and national forests are pet friendly, provided they are on a leash, while national parks will only allow dogs on a leash in the picnic areas, but not on the trails. As you can see from the map below, which we've created to identify the areas that are off limits to dogs, things are a little more complicated than those 3 rules of thumb though. Unfortunately, between Tucson Mountain Park at the South end of the range and Saguaro National Park West at the North end, the entirety of the Tucson Mountains to the West of town are off limits. On the opposite side of town, Saguaro National Park East makes pretty much all of the Rincon Mountains a restricted area. Since that list includes many of the closest and most popular hiking trails around town, it's easy to see why it can feel like the local trails are so unfriendly to Fido. However, those restrictions are in place to protect another four legged friend. After going extinct in the 1990's, the Arizona Game and Fish Department began an effort to reintroduce bighorn sheep to the Pusch Ridge Wilderness in 2013. Although there have been several transplants and many new lambs born into the herd since then, their survival is always precarious. There have been deaths caused by everything from mountain lions to pneumonia and the authorities want to do everything they can to ensure they survive. That's why having dogs roam the trails, making the sheep uncomfortable, and introducing who knows what kinds of seeds and bacteria through their droppings is seen as too great a risk to allow. Here's a link to the official order with a map of the area. The last area that makes you leave the pup at home is Sabino Canyon Recreation Area. While it doesn't cover a huge amount of land, it is the most popular trailhead in Tucson and lots of great hikes connect to it, which makes it feel bigger than it really is. The good news is that Tucson has so many hiking trails that even with those restrictions, there are plenty of great options for hikes where you can bring your best friend. If you remember the rule of thumb from earlier, state parks are generally pet friendly, which means Picacho Peak and Catalina State Park are in play. You'll just want to be aware of the signs in Catalina State Park that mark the boundary of the bighorn sheep management area. There is also a huge network of trails up in the Tortolita Mountains to the Northwest of town, up by Oro Valley and Marana, where dogs are welcome. The Wild Burro Trailhead is the primary place to begin any adventure in the Tortolitas. 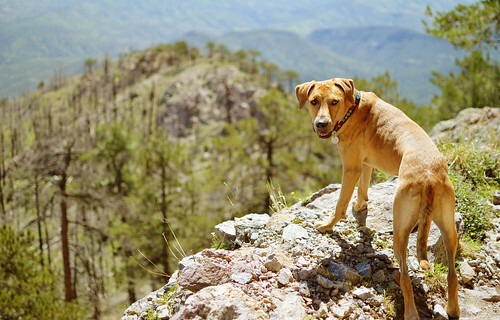 Since the Santa Catalina Mountains are almost entirely Coronado National Forest land and the national forests allow dogs on the trails, most of that range is fair game as well, including every trailhead along the Catalina Highway to the top of Mount Lemmon. Northeast of town, in between the Catalinas and the Rincons, there are miles and miles of amazing trails where you can have an awesome dog friendly hike. There's Milagrosa Canyon, Agua Caliente Hill, and all of Redington Pass to explore out that way, which should keep you both busy for awhile. 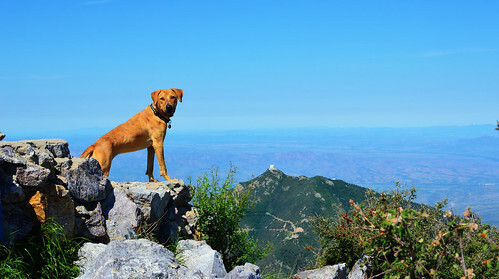 Finally, like the Catalinas to the North, the Santa Rita Mountains to the South are also mostly managed by the national forest, which means you can take your pooch all of the way to the top of the highest mountain around Tucson, Mount Wrightson, if you both can make it that is. There are all kinds of good reasons to bring a dog with you on a hike. 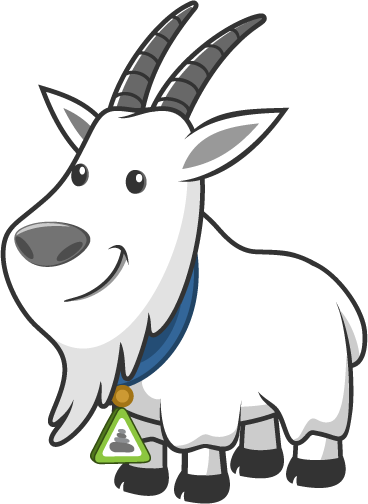 They get an adventure and exercise while providing you with friendly companionship and even a bit of security. On the trail or at home, they really are man's best friend. Even if bad human behavior, like not cleaning up after their dogs and letting them roam off leash, was completely eliminated, there are still some good reasons to keep pups out of certain areas, mostly for the sake of the local wildlife. Between this post and the dog friendly friendly filter on Trailvoyant, you should have everything you need to plan the perfect hike for you to enjoy with your pooch, so get out there! Want to start to hike with my dog. I think hiking with dog can be a fascinating way to explore America's great outdoors from a canine perspective. This is a great article thanks for sharing this informative information. I will visit your blog regularly for some latest post. An interesting and very actual topic on the field! For more details about Trail voyant has a dog friendly hike.